Can YouTube TV Replace Your Cable Subscription? Cord cutters who want access to their favorite television shows have a limited number of options, and all of them have their downsides. Until now, access to network television has been a big one: you either needed an HD antenna and a DVR, or a patchwork of services to cover access to the major stations. 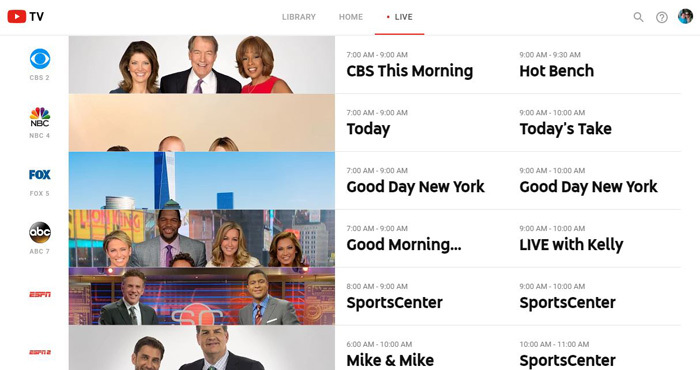 But today, Google has jumped into the cable replacement arena with YouTube TV, a streaming service that offers ABC, CBS, Fox, NBC and the CW as well as a range of cable channels. For $35 per month, you get around 40 channels. This puts YouTube TV in line with popular Sling TV (starting at $20 per month), but YouTube TV offers fewer channels than AT&T's DirecTV Now ($35 per month) or Sony's PlayStation Vue (starting at $30 per month) for the same price. CBS has been particularly hard to find on streaming services. The network pushes its own CBS All Access subscription ($6 per month or $10 per month without commercials). Only PlayStation Vue and now YouTube TV offer CBS without an additional subscription. YouTube TV includes access to a virtual cloud DVR with unlimited storage for recording all your favorite shows, making it easy to catch anything not available on demand. Recordings are saved for nine months, and you can stream them from anywhere. That's a feature currently only offered by PlayStation Vue, and it only saves recordings for 28 days. Sling TV is currently testing a DVR service for Fire TV users only, and DirecTV Now promises DVR in the future, so DVR may not be a selling point for now. YouTube is a good option for families. You can have up to six accounts for your household, each with its own login and DVR library. Other services limit you to a single account, though all the services allow you to stream to more than one device: two on DirecTV, up to four on Sling TV and five on PlayStation Vue. YouTube TV's service still has some snags. The biggest is that it doesn't support Apple TV, Fire TV or Roku, so Chromecast is the only way to get it on your television. You can watch YouTube TV on your computer or mobile device (on both Android and iOS devices), but wouldn't you rather watch TV on your TV? Google is now offering a free Chromecast with your first payment, which helps, but it doesn't change the fact that YouTube TV is not a solution for anyone without a Chromecast. YouTube TV's selection of cable networks is also a bit skimpy. Though the service offers a good number of channels, it's missing some popular networks: CNN, AMC and Comedy Central. Before you decide this is the streaming service for you, check the channel listing to make sure your must-haves are available. YouTube TV is currently only available in select markets: Chicago, Los Angeles, New York City, Philadelphia and the San Francisco Bay area. That's expected to grow, but for now, anyone outside those cities is out of luck. If you do live in an area where YouTube TV is available, a 30-day free trial will let you give it a test run. If you decide you don't like it, simply cancel. But other streaming services offer stiff competition. Both DirecTV Now and PlayStation Vue offer more channels for the price, and Vue includes access to CBS, if that's a must-have for you. If you use Apple TV, Fire TV or Roku, both Sling TV and PlayStation Vue can stream on all major devices, while YouTube TV users are limited to using Chromecast to see things on the big screen. YouTube TV is still new to the market, and we could see changes such as more availability, more channels and more streaming player support as the service grows. Sign up for YouTube TV today if you live in a supported area, or sign up to be notified when YouTube TV is available if you don’t. Why would YouTube start a TV channel service that you can’t even access on your TV? I’d subscribe to it, but I have a Roku and I’m not going to purchase Chromecast also. How many TV's can you hook up? So, like most Americans, I have multiple rooms with TV’s connected to cable. I currently have Chromecast connected to just one TV, (along with cable TV). What about my other 3 TV’s that are connected to cable. I’ll need a Chromecast for each one but is there a limit to how many can be connected. How will this affect my wifi with multiple sets running at once? I smell trouble! I’d love to drop my $200 Comcast bill but your story does not address these very real issues. What’s the answer? The YouTube service lets you stream to 6 devices, so you’d be covered. If you’re streaming to 4 TVs simultaneously, you may run into bandwidth issues if you have a slow connection. Youtube TV is limited to 3 simultaneous streams. While Youtube TV allows you to use 6 different accounts you are only allowed 3 simultaneous streams. Another thing that not many websites have mentioned about Youtube TV’s DVR features is that it is not so “unlimited” in fact it is very limited. When a show that you have DVR’d becomes available On-Demand then you are forced to watch the On-Demand version instead of your DVR’d version. Biggest downside with On-Demand is the inability to skip over advertisements.